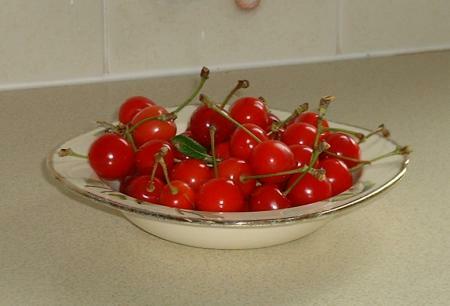 Life is just a bowl of cherries, and here are some I picked earlier. Having been out of action for what seems like an age, I decided to cut the grass, as this doesn’t involve lifting my arm higher than it will go. I knew it would be hard, everything is when you can only use one arm properly, but I thought I was up to it. A few weeks have now passed and things are improving slowly. A trip to the doctor has thrown more light on my situation. She feels I over-stretched my already frozen shoulder and tore a muscle. Hence the terrible pain. The muscle has now healed, and the pain is much reduced, though lack of movement is still an issue. The good news is, I can use my computer and potter about. On Wednesday June 8th at around 4.30pm, disaster struck. Thought it was about time I posted some pictures, just to show this year hasn’t been all gloom and doom in the garden. The wind is still blowing, but at least it is warm and sunny now, so yesterday we decided to spend the day at the seaside, in Skegness.